It is the policy of a dictionary to enumerate the senses of a word. The senses of the word “court, n.” in the Oxford English Dictionary number nineteen. Why not eighteen? Sharper analysis promises to reduce this promiscuity. But why not twenty? Some hapax legomenon threatens to upset the count. Our dictionaries—even “the definitive record of the English language” (i.e., the OED)—testify to the arbitrary ways in which polysemy must be numbered. New uses are found for old words and available senses are multiplied. The lexicographer collects examples of usage and groups them according to related uses and senses. But the poet urges that each true metaphor is a bold departure from the literal, one that expands the language in a new direction. As we pass from lexicographical to literary critical concerns, we refine our theories of how metaphors mean. Consider the example of Court metaphors for the mind. The word “court” has a variety of senses: we imagine a court of law or the retinue or body of courtiers who assemble around a monarch. A court is variously a place (an enclosed or confined area), a collection of persons, or a political institution. Court may be held, or it may be paid. When the mind is figured as a court, which of these senses of the term is selected? A yard, a princely residence, a retinue? Who shall judge? The mind is a court. In it we are enclosed and confined as in a court-yard. But the mind is also a scene of proceedings, a court in which precedents are made, testimony heard, or judgments overturned—a court of law, a court of conscience. Alternately, the mind may prove no more than an assembly of personified impressions and faculties, individuals, or courtiers, who seem attendant upon some executive power but in reality busy themselves in pursuit of their own petty concerns. Diverging senses of a word help mark moments in political history: originally, it was the monarch himself who dispensed justice and presided over the court.2 The Lord Chancellor was “Keeper of the King’s Conscience.” The royal court was a place filled with courtiers and a court of law both. By the time of the 1688 revolution it is easier to make distinctions between a king’s court and the court of law. In part, James II’s meddling with the courts precipitated his replacement and reinforced distinctions between the executive and judicial powers of government.3 We would expect to see metaphors from the long eighteenth century display the disambiguation of these two senses of “court.” And we do. 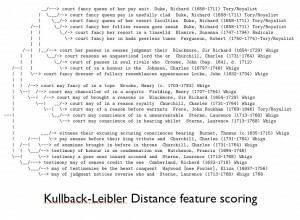 Moreover, the Court metaphors collected in The Mind is a Metaphor Database, cluster in ways in which politics and word sense are significantly correlated. In fact, the use of metaphor divides neatly along party lines. 1 In an essay collection like Andrew Ortony’s Metaphor and Thought , theorists of metaphor from Searle to Lakoff who agree about little else grant that metaphors do not operate—as was thought by the classical rhetoricians and eighteenth-century writers on belle lettres —at the level of the word. Meaning is something best located (if we must locate it) at the level of the sentence. But the differentiation of literal and figurative at the sentence level is uncomfortable work at best; and a literary critic who, like the author of these blog-like pages, works without a fully developed theory of meaning can only ever make hesitating, contingent claims about meaning and metaphor. I for one write literary history because I am persuaded by Quine’s suggestion that the basic unit of significance may be the whole of a language, the complete science or a theory. Under the narrow heading “COURT” then, a reader must be prepared to encounter theoretical discussions of influence, theatricality and power; the biographies of the opposition figures who collected around the Prince of Wales; a compact history of natural law and common law traditions; philosophical discussions of testimony; a Begriffgeschichte-style analysis of the concept of conscience; and fictional representations of trials in the novels of Henry Fielding. The unit of significance designated by the rubric “COURT” is a wide web of intellectual history. 4 A cluster tree created by D. Sculley serves as a striking visualization of word sense disambiguation along party lines. Machine learning methods separate Whig and Tory and disambiguate sense at the same time. The top branches of the tree are filled with Tories; the bottom, with Whigs. The hierarchical tree is constructed from abstract “bag-of-words” representations of the metaphors. 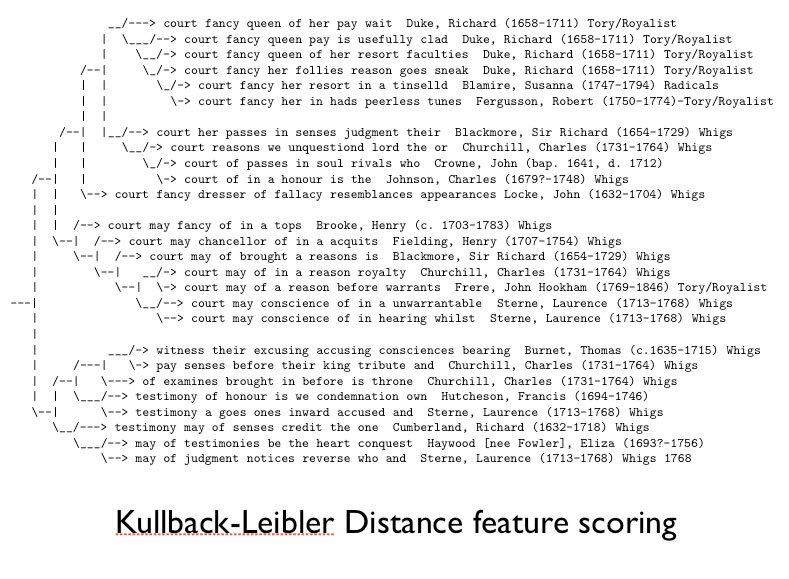 The computer knows nothing of eighteenth-century politics or word sense but groups metaphors according to feature scores generated from Kullback-Leibler distances. 4 See, for example, Lakoff’s Moral Politics: How Conservatives and Liberals Think . 2nd ed. Chicago and London: University of Chicago Press, 2002. Must we mean what we say? In the case of metaphor, meaning is underspecified, patently false, or—according to some theorists—somehow transmuted. Somehow changed. Words must mean just what they mean.1 But what of speakers? What of writers? We say one thing but mean, as it were, another. “As it were“—a curious, parenthetic phrase. As if it were so. A phrase used “to indicate that a word or statement is perhaps not formally exact though practically right” (OED). The mood is subjunctive. One would say it, if only he could mean it. The philosopher is much given to hedging claims with an “as it were.” So Descartes writes, “I am not merely present in my body as a sailor is present in a ship, but […] I am very closely joined and, as it were, intermingled with it” (56). The intermingling or permixing (the Latin is permixtio) is indeed “perhaps not formally right.” I am not the sailor, not the ship, not even the voyage. In the Cartesian account, I am more like the tar, pitch, and tallow—the sealant, as it were. Oh unfortunate dualist, betrayed by a philosophy of language. There are not two kinds of meaning, literal and figurative. Nor are there two substances, matter and mind. Still we let the one dualism structure the other and are held captive by false distinctions. In his Essay Concerning Human Understanding , Locke uses an “as it were” to bracket the metaphor of his opponents: “It is an established Opinion amongst some Men, That there are in the Understanding certain innate principles; some primary Notions, koinai ennoiai, Characters, as it were stamped upon the Mind of Man; which the Soul receives in its very first Being; and brings into the World with it” (I.ii.1). “As it were” has its equivalents. There is the Latin tanquam, the alliterative “so to speak,” and the polite pair “if I may so say” and “if I may be so bold.” A character in Henry Fielding’s Amelia begs leave: “So many tender Ideas crowded at once into my Mind, that, if I may use the Expression, they almost dissolved my Heart” (I.iii.3). Andrew Marvell uses a parenthetic phrase in his “Dialogue Between the Soul and Body.” The imprisoned Soul complains that it is “hung up, as ‘twere, in Chains / Of Nerves, and Arteries, and Veins” (ll. 7-8). Marvell’s parenthetic is paradigmatic. As in Marvell, the qualification “as it were” often marks imprisonment of the mind or soul in the body. The believer believes that the soul will go free. The prison is only a prison as it were. The subjunctive “as it were” is an incantation or an amulet. The philosopher produces it to protect himself from his own terminology. A metaphor is meant to open a space to mean something else. The dualist would stage a prison break and repeats—incants—the parenthetic in hopes of navigating some impossible distinction. I quote Ludwig Wittgenstein: “A picture held us captive. And we could not get outside of it, for it lay in our language and language seemed to repeat it to us inexorably” (§115). 1 Donald Davidson argues, correctly I think, that “metaphors mean what the words, in their most literal interpretation mean, and nothing more” (245). 2 Sarah Fielding writes of Lady Dellwyn, “she had no Food from outward Objects, to employ her animal Spirits, and they therefore prey’d at home; and oppressed her own Mind” (I.i.10). 3 Locke deploys “as it were” more than fifty times in the Essay . See Locke’s assertion that the memory is the ability to to “revive” ideas and “as it were paint them anew on it self” (II.x.2). Our ideas are “as it were the pictures of things” (II.xxix.8). The mind may be “as it were manacled in the chain of syllogisms” (IV.xvii.5). The Neoclassical author must observe decorum, strive for both correctness and simplicity, and avoid low, vulgar comparisons. In literary history, notably since Samuel Johnson’s Lives of the Poets , the elegance of Neoclassicism is contrasted with the extravagance of seventeenth-century Metaphysical wit. Metaphor flouts propriety by putting improper names in the place of proper ones. Metaphor is displacement. What place then can metaphor have in those studied attempts of the Neoclassicists to observe propriety? No paradox lurks here. Metaphor occupies a central place in eighteenth-century literature. Truly, there is little, if any, literature that does not avail itself of metaphor. The literature of the eighteenth century is no exception; it is awash in figuration. Propriety is a false standard. Critical pronouncements and artistic practice typically diverge. Hobbes and Locke, master metaphorists, are repeatedly cited as professed enemies of figurative language; belle-lettrists warn against metaphor and then deploy it in the same sentence.2 Do as I say but not as I do. I will not explore contradictions under the sign of aporia. My discussion of propriety prefaces a selection of tortured comparisons from The Mind is a Metaphor database. Extravagant, gross, and vulgar violations of propriety interest me. Decorum is breached to specific ends. The literary traditions that focus on capturing “the inwardness of our mental lives in a quite direct, experiential manner” succeed by “straining the resources of everyday language in the interest of fidelity to this experience” (Toulmin 4). Against constraint we strain. And in the Brain ten thousand Landskips draws. While peaceful Rest their uncall’d Neighbours take. No Avenue left open to the Mind. Or with their monstrous Mixtures fright the Brain. The stanza is itself a “monstrous Mixture” of metaphors and personifications. Blackmore, a versifier of Lockean philosophy, gives us images that would explain mental imagery; he pictures ideas that sleep in the consciousness and animal spirits that wake when we dream; he produces an allegory of these actors and their activities and furnishes the variegated scene with pencils, hoards of treasure, landscape paintings, caves, lodgings, chains, and avenues. The figuration is both in and out of doors, a fancifully painted “Landskip” but also the brain’s terrain. Blackmore’s metaphors are often characterized as bombastic by his contemporaries. Yet Blackmore works in the epic form. He wields pentameter and couplet. His figuration is contained in “epic similes.” His models are Virgil and Milton. He pursues propriety. Still, Blackmore found himself attacked by Dryden and later by the Scriblerians and Alexander Pope. A cold, long-winded, native of the deep! Th’unconscious flood sleeps o’er thee like a lake (II.288-92). In closing I treat the reader with two hydrological metaphors, both of which strain propriety. Impropriety itself may be characterized as a flood in which metaphors arrive torrentially. Blair notes, “Whenever the imaginations of the vulgar are much awakened, or their passions inflamed against one another, they will pour forth a torrent of Figurative Language” (275). After a weak mind has been duly prepared, and turned as it were, by opening a sluice or torrent of high-sounding words, the greater the contradiction proposed the stronger impression it makes, because it increases the puzzle, and lays fast hold on the admiration; depositing the small proportion of reason with which it was before impregnated, like the vitriol acid in the copper-mines of Wicklow, into which if you immerse iron, it immediately quits the copper which it had before dissolved, and unites with the other metal, to which it has a stronger attraction (168). The superintendents of propriety instruct us to not concern ourselves with the workings of sluices, or with the corrosive effects of vitriol. Technical vocabularies are faulted by those who begrudge vulgar professionals their own “high-sounding” words. Blair finds metaphors “borrowed from any of the sciences, especially such of them as belong to particular professions, are almost always faulty by their obscurity” (362). While the Banks of Discretion keep within their natural Chanel the proud Waves of Passion, all calm and serene, glides along the silver Current, inlivening the adjacent Meadows, as it passes, with a brighter and more flowery Verdure. But if the Torrents of sensual Love are permitted to descend from the Hills of credulous Hope, they may so swell the gentle Stream, as to make it difficult, if not impossible, to be retain’d in its usual Bounds. What then will be the Consequence?— Why, the Trees of Resolution, and the Shrubs of cautious Fear, whose intertwining Roots had contributed to support the frail Mound, being loosen’d from their Hold, they, and the Bank itself, will be seen floating on the Surface of the triumphant Waters (III. L63, p. 431). Richardson pictures the stream of consciousness as a passionate torrent. He extends his metaphor beyond all belief. The critic may value propriety over the bombastic, the strained, and the mixed. Or he may come to prize the excessive language Johnson dismisses as a “cumber of magnificence” (in Life of Cowley 116). We’ve seen that Hugh Blair pictures cumbrous language as a vulgar “Torrent” and Pope as an “unconscious flood,” and we begin to understand that the metaphor for metaphor is liquid. On this anniversary day, metaphors proper and improper, “high-sounding” and vulgar, pour forth as a torrent of language. The sluices open. The oceans rise. The tide has not yet turned. “Triumphant Waters” and high-sounding, empty rhetoric will cover, bury, and drown us all. 1 The sentiment is John Dryden’s. But see Addison’s revision of the definition in Spectator No. 62: “Mr. Dryden’s Definition of Wit; which, with all the Deference that is due to the Judgment of so great a Man, is not so properly a Definition of Wit, as of good Writing in general.” See also William K. Wimsatt and Cleanth Brooks in Literary Criticism: A Short History . vol. 1. U of C Press: Chicago and London, 1987. pp. 228-34. 2 See also The Ladies Rhetoric : “Metaphors are Words taken from their natural Signification, and from the Place where they were proper, to make them serve in another that bears some resemblance with the natural Signification” (Anonymous 88). Or Charles Rollin’s 1734 translation of The Method of Teaching and Studying the Belles Lettres : “The metaphor is a figure which substitutes the figurative terms it borrows extraneously, as it were, by a kind of exchange, in the room of proper words which are either wanting, or have not energy enough” (162). The fifth sense of “propriety” in the OED is “the proper, strict, or literal sense of a word” (emphasis mine). Behind all these definitions stands the Aristotelian pronouncement that “Metaphor consists in giving the thing a name that belongs to something else” (Poetics 1457b5-10). 3 On all these points Hugh Blair agrees with Lord Kames. Metaphors may be “too far pursued” (370). Cowley, Shaftesbury, and Young are prone to wearying us with the play of their fancy. Shakespeare is faulted for making two metaphors “meet on one object” (365). And even Pope is faulted for producing periods that are not all literal or all figurative but mixed.